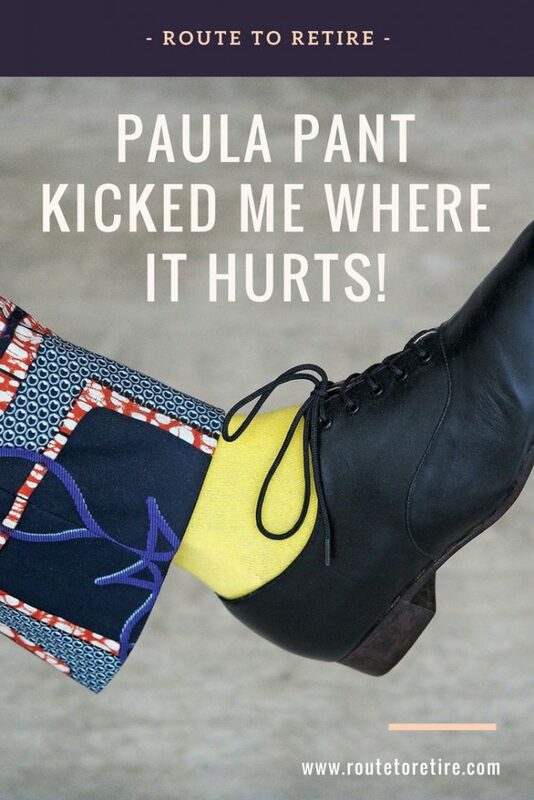 Ok, she didn’t physically kick me, but Paula Pant found a way to get into my head. She worked me up into a real tizzy (do people still use that word?). It crushed me and took me days to think through and re-evaluate some things. First off, if you don’t know Paula Pant, she’s the host of the Afford Anything brand, which includes her blog and podcasts. She’s also one smart cookie and has a great sense of humor. 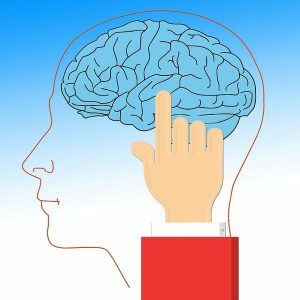 Intelligence + laughs = great podcasts. And, it’s those podcasts of hers that I enjoy listening to on a regular basis. 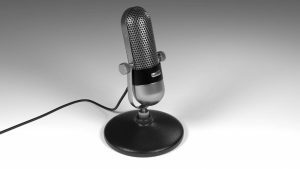 She even made my The 10 Best Financial Podcasts list. As an added bonus, I had the opportunity to meet Paula at FinCon this year. She was the only person I was intimidated about introducing myself to at the conference for some reason. However, Miss Mazuma gave me a swift kick in the pants and I’m glad she did. Paula was super friendly and easy-going. I would not have been happy with myself if I missed that chance. So what did sweet Paula Pant do to me? Great question! I was listening to an older episode of her podcasts (because I’m constantly behind in my listening!). The episode was #91: How to Spend Less, Earn More, and Grow the Gap. The idea of the podcast makes complete sense. Paula’s premise is that in the personal finance space some folks view cutting expenses as the most important habit to possess. Others view earning more money as the more important factor. The Paula Pant way of thinking though is that they’re both important. And rather than putting everything solely on one side of another, you should focus on growing the gap between your earnings and your spending. Jim, this makes complete sense – how can that have screwed with your mind? Hold tight – I’m getting there! One of the examples she gives is when you go to a restaurant and the entree you want is $18, but there’s a cheaper option for $14. You really want the $18 entree, but the $14 is “good enough” and it’ll save you a few dollars, so you go with the cheaper one. Hmm, this does sound a little familiar. Then she continued with a couple other examples like having a party and instead of buying Coke or Pepsi, you get Big K because it’s cheaper. Well, we don’t have a Kroger near me, but we do almost all our grocery shopping at Aldi… um, continue on Paula. How about a scenario of heading to the airport? Maybe you normally pack snacks to bring, but this time you forgot. Instead of buying over-priced food at the airport, you decide to just go hungry. I guess this represents Paula getting into my brain… weird, right? Ok, this is just getting creepy, Paula Pant… are you in my head?! What about a case of needing to go to the airport super early in the morning? Instead of taking an Uber, you have your spouse drop you off even though it’s inconvenient for them to do so. Well, you nailed me dead on, Paula. It sounds like you understand how skipping these stupid extras can help you out financially. But then she continued on to say that those kinds of things make you feel like you’re doing the right thing. However, they’re not going to make a noticeable enough dent in your finances to matter much in the long run. She goes on to say that even though it gives you a psychological feeling of feeling frugal, if you calculate the total savings over time, you’re really not saving that much. It’s not going to make the big difference in your journey to financial independence. So step one is to stop fooling yourself and focus on the things that actually matter and not worry so much about the small things… things like the big four expenses – housing, taxes, transportation, and food. The podcast went on from there, but this was enough to shake me up. She totally struck a chord with me. I’m that guy she talked about. And everything she said makes complete sense. It’s true. Saving a few bucks that one time at a restaurant won’t make a significant difference in the long run. Here’s the problem – this whole idea goes against every frugal bone in my body. And that ruined me for days. It was all I could think about. It makes sense that you’re not going to change your financial life by choosing a cheaper entree at a restaurant or buying cheaper cola for a party you’re hosting. Sure, those little things are going to add up over the course of the year. Maybe you’ll even end up saving an extra $500-1,000 over that period of time. But will that really make that much of a difference to allow you to reach financial independence any earlier? Yeah, maybe by a few months. After thinking about this for a while (and believe me, I did! ), I don’t know if that’s necessarily the whole picture. At least, it might not be the whole picture for folks like me. 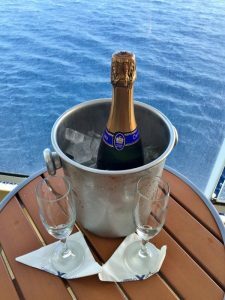 Complimentary champagne on the cruise ship balcony… could life get any better? I think most of my friends know me as the cheap #@$%. I’m very particular as to how and when I spend my money. I’m naturally frugal – it’s just how I’ve been ever since my credit card debacle of running up too much debt back in my college days. We shop at Aldi for our groceries and I would be appalled to spend more than $35 on a pair of shoes. However, it doesn’t bother me to be frugal. I don’t feel like we’re missing out. It might surprise you to know, however, that I’m the guy that almost always tips at least 20% on a restaurant bill. And at the bar, for example, I don’t mind buying a round for my friends. The difference is, among other things, both of those can be a money drain and I’m more of a homebody, so you won’t find me there that often to begin with. We do take vacations and trips on a regular basis… probably more than a lot of our peers. And when we go, we splurge on what matters to us. We know what we want but cut back on all the extras that we don’t. When we book a cruise, for example, we ensure that we have a balcony because that’s important to us even though it costs a lot more money. But, there are a lot of things that aren’t important to us, so we skip ’em. We don’t fly first class, we don’t get a suite on the cruise ship, and we don’t stay at a fancy hotel for the day before the cruise. We’re also not out shopping for souvenirs and hitting all the pricey restaurants on our trips. And, of course, we don’t just book the cruise and flight right out of the chute – we search for good deals. Sure, you can stop being frugal on some things like the dinner choice at a restaurant. However, for someone like myself, that doesn’t make a lot of sense. I’m not picky about food in the least (Mrs. R2R loves me for that! ), so I don’t usually care what I order at a restaurant. Because of that, the cheaper item seems to be a good match most of the time. In other words, I think a better idea might be to figure out where to draw the line on your spending. That’ll definitely be different for each of us. And that’s Ok. 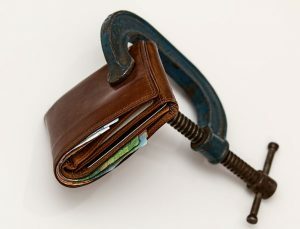 If your wallet’s not in a vise while you’re in debt, you’re doing something wrong… very wrong. Now, I will say that I think that if you’re someone who struggles with money, you probably want to take a deeper dive into everything and figure out all the places to cut before you start “enjoying your lattes” so to speak. If you’re sinking in debt, I don’t think you shouldn’t be spotted in restaurants or on vacations very often. You have a lot more important things to focus on. Consumer debt is the devil in our lives and you should do what it takes to make it hurt to get out of it. Granted, I do think you have to reward yourself periodically to make the journey worthwhile. And by periodically, I mean when you reach specific goals and not every week! If you think that’s harsh, so be it. I’ve been there, done that, and I know what living in debt is like. Cracking down and working your way out of it is tough, but in almost all cases is temporary. Make it happen and get out as soon as you can. 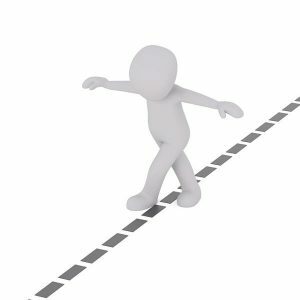 Balancing while naked – who doesn’t do it?! However, if you’re working your way toward financial independence and you have no consumer debt to worry about, you have a little more flexibility. This especially rings true if you’ve built up some solid assets and investments and are now on cruise control toward financial independence. That means you can pick and choose a little more on what you want to cut back on and what you want to splurge on. My concern is that I think every person needs to find a balance and that’s not always cut and dry. The worry is that if you have the mantra of “live for the moment”, you might be overspending. Moreover, if your goal is to reach financial independence as soon as possible, that might become a big hindrance. However, if you’re the big tightwad and control every penny, you might be trading today’s joy for tomorrow’s. Figure out the amount you need to save to meet your goals for financial independence or retirement in general. Set it all on autopilot to be moved from your paycheck and bank accounts automatically. Then use a tool like Personal Capital for free (my favorite word!) to just watch your retirement accounts grow! Then the rest is yours to do with as you see fit. Spend a little bit and have some fun! Believe it or not, you can be frugal and happy at the same time! I’m naturally frugal (as is Mrs. R2R) so it doesn’t bother me to cut back on things – stuff we don’t need. A long time ago, we also lost interest in that “other stuff” – ya know, something you think you need to make you happy, but the same thing that loses its luster after a couple months. New cars, anyone? We don’t “miss out” on things – we enjoy our time together and always seem to have something fun going on. We’re careful with our money and have built ourselves into a position where we can afford to do several trips a year without taking away from our early retirement plans. But like I already said, we still shop for and find deals. We also know what we want and cut back on all the extras that we don’t. Again, it’s not about the price (we do have the money for the extras). Instead, it’s a matter of knowing that we don’t have a need for them – they’re not going to make us any happier. And that’s what it’s all about. Fancy restaurants or fancy clothes don’t do it for us… so we skip ’em. However, are we missing out by not sometimes picking the more expensive options? Did Paula Pant figure us out and bring to light a problem we just weren’t noticing in our lives? I don’t believe so. We’re not really wanting for anything right now and if we were, we might reconsider. But that’s just us. For you, spending a little more on your meals or other extras might be your thing… and that’s Ok.
Everyone is different and I’m not judging. Paula’s podcast makes sense and for a lot of folks, it provided some excellent points to consider. Personally, though, we’ll stick with our frugal lives since we’re doing just fine with our way of living. 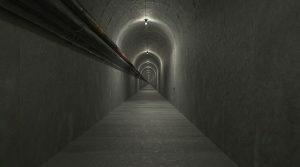 Tunnel vision… thanks for the shake-up, Paula! Let’s end this by making this clear… I love Paula Pant (don’t tell my wife that!). She’s more than an influencer in the personal finance community – she’s a visionary as well. She possesses that unique talent to not just look at a problem, but also the ability to step back and look at the greater picture. That’s an extremely rare trait in a person, especially for someone as young as she is. I’m not sure why hearing that part of the podcast from Paula struck me the way it did, but I’m glad that it did. Sometimes you get tunnel vision in life and don’t question the everyday path that you’re on. This gave me a good opportunity to evaluate the details and just do a check. After spending a number of days reflecting on this, I feel that we’re in good shape and I’m not “missing out” on anything that we care about. But Paula definitely gave us the great lead to determine if that was actually the case. How about you? Are you cutting back too much and missing out because you’re trying to push yourself to save more? ← The Move to Vanguard… Bye, Bye TD Ameritrade! Well, Paula did give me a kick alright! 😉 Although I’m sure I’ll remain somewhat frugal on those little things (it’s in my nature! ), I’ll probably think of this podcast periodically and loosen up somewhat. I’m guilty of being too overly focused on the small things Jim! With only $2.5 million in net worth, it’s obvious my finances are a complete disaster. Clearly I’m kidding, but you do bring up a good point — A person’s savings rate shouldn’t be so tight that a single bag of peanuts really matters. There’s a huge difference between a 1% savings rate and a 50% savings rate, but when you’re already at 49% that extra 1% won’t make a huge impact. That said, if you make *enough* smart financial decisions (even small ones) over and over they do start to add up. Year after year and dollar after dollar. That’s a great way to put it into perspective, Mr. Tako. Your mention of a bag of peanuts fits right in because I guess when you’re talking big numbers those small things really are peanuts! Jim, great post. Paula definitely pinned a lot of us with that $14 vs $18 dinner order. Great point on having balance, and not going too far on the frugality side to diminish joy today. Your mindset is right – you don’t need “The stuff” to get joy. You and I are a lot alike in that regard. I’ve found automating a high savings rate is sufficient for our lives. Know you’re saving a ton, and enjoy spending what’s left. Balance. Great reminder. You and I are a lot alike period, Fritz! 🙂 It’s funny that I only figured out our personal savings rate a few months ago and it’s around 60%… you’d think I’d loosen the reins on those little things a bit more. You’re right that it’s a great reminder! I think there’s a balance between what you cut out and what you’ll spend money on. It’s all about spending funds on what matters to you – and that’s different for many people. I’ve had people drop me off at the airport at 4 am so I could save $200 on airport parking, so it was worth it to me (I bought them beer in exchange, so it was a good trade!). On the other hand, I pay to get my oil changed by a professional because it’s more convenient for me. Mmmm, beer!! You’re so right – figuring out what’s important is key – as long as you’re still putting away for future before you start spending on the other stuff. I save the small amounts of money on the things I don’t care about and don’t worry about spending a few extra dollars on the things that I do. I feel it balances out in the end. I was thrilled to meet Paula too! That’s the smart way to do it – balance always seems to win out. Paula’s definitely a rock star! Great post! I can definitely relate. I think my kick in the pants came when a guest on the Choose FI podcast (sorry, can’t remember exactly who) made the statement that if we get the multi-thousand dollar decisions right (housing, cars, healthcare, etc.) the small “skipping a latte” decisions become almost negligible. That was a brain buster for me…but in a good way. Thanks, Aaron – much appreciated! Those “a-ha” moments are fantastic. I just recently started listening to the Choose FI podcasts and have been blown away by how great they are. I don’t think I heard the one your referring to, but I can imagine that being an eye-opener with those guys. Great post! I enjoy Paula’s podcasts and do recall that episode. I agree with winning the battle with you largest expenses first. The old 80/20 rule. I am about value as a few other commenters have said. If something brings me value and it costs a little more, no guilt. However, if I spend more on something that has the same value to me a something less expensive, I feel like I was taken and the guilt creeps in. I have to admit, I have had those menu battles in my head too. Gwen’s awesome – she was another one I was glad to meet at FinCon this year! Love hearing from people like you that have been there, done that. I’m in a similar spot as I was the coupon-clipping guy as well, but out buying dinner for groups of 10 and just slapping it on a credit card with no good way to pay it back. I definitely get it and focus on those big expenses, but ever since I dug myself out of debt years ago, I still can’t help to manage the small things that really don’t need managing. Paula’s definitely right that the psychological factor can kick in and throw people off with the minutia. I don’t feel like I am missing out on anything. I think being frugal is in my nature so it makes it much easier. Like you, I will save on small stuff just because I really don’t care. Travel is where I usually spend more because it matters to me. Great post Jim. It is about finding balance. I have found that the bulk of our saving come from managing the big four. As stated, managing the smaller expenses falls under the category of low hanging fruit. Managing the smaller expenses can be the difference between saving 30% or 40%. With the cost of a plate, I look at what it is. For example, are both the $14 and $18 dishes chicken dinners or is the $18 dinner a steak. I don’t mind spending on what I like, but I am hard wired to find value. Thanks, Dave! Ooh, that’s an interesting twist on the dinner plates – I never considered that. I’m assuming Paula meant that they were two different meals, but who knows?! Value is definitely a great feeling to come by! It sounds like you got uncomfortable for a while, and that motivated you to make a change. That’s a good thing!!! I do agree that if I have to make a conscious decision to save money, it had better be a big win than a few dollars! Although I will also take those couple of dollars too! Good point on the big win vs the small dollars! I’m not over the “every little bit counts” mantra, but I’ll definitely take a second look at the small stuff before just passing on it. precedence. 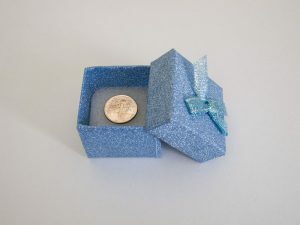 If you’re not frugal on the little things, chances are you’re not frugal on the big things either. Now that we’re more comfortable financially AND learned to control lifestyle inflation, I’m much more comfortable spending on the little things. Yes, I purchased a sandwich on the flight to Cancun. I could have gone hungry and ate granola bars, but I’m also looking out for our kid. Kids need food. I still think going full out frugal when I was young was a good move. It sure did not hurt our finance. Good points as always Joe! Once you can get the right habits set, the rest should just take care of itself. Being very frugal for the past several years was a smart move for our family too. It taught us a lot about how to handle our finances better. I think Paula is spot on in her thinking with this. You summarized nicely why it may be important for someone to think through the little things though depending on where they are in their financial journey. I am with Paula and others in that I do not stress the little things anymore. I set my overall big goals and as long as I am hitting them the rest of the spending all can blend together. Life is way to short. That’s the way to do it, DM! I definitely get it… now I just have to convince myself to follow-suit. I guess I’ve been frugal way too long! I think growing the gap between spending and earning is key. I was able to go from saving $50 a month to over $1100 a month just by cutting out the crap and paying off debt. The more income I kept, the more I was able to save. Great post! Wow, that’s a fantastic jump in monthly savings – nice job, Miriam! That’s a lot of extra money to be able to put away for your future for sure! I agree with a lot here. The one thing I would add is I *do* enjoy flying first class. I only fly 2-3 times a year. The way I look at it… is it worth an extra $500 to fly first class (an extra $1000 if my wife is with me)? For me the answer is yes. And I must say, once you start flying first class, you will never want to fly coach again. It’s so much easier. And for those debt free, at least half way to FI, if you only take one vacation a year, for goodness-sakes… fly first class.